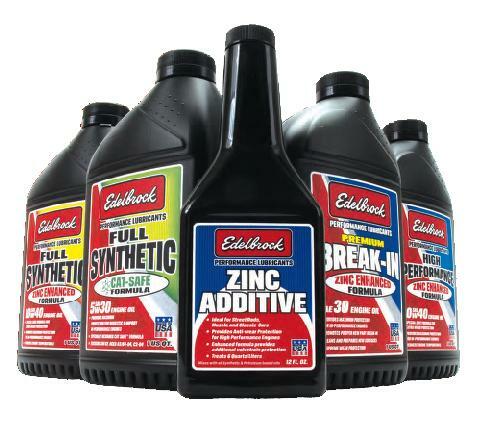 For over 73 years, Edelbrock has been committed to manufacturing the highest quality performance parts, and our new line of lubricants is no exception. This exciting new line of lubricants is aimed at delivering key additives to all of the critical engine components – offering you the ultimate in protection for your street rod, muscle car and late-model domestic or import vehicle. Edelbrock has teamed up with Torco Advanced Lubricants to provide a premium line of lubricants that exceed the strict standards for Edelbrock high performance crate engines, valvetrain components, cylinder heads and supercharged engines. Since 1950, Torco has formulated and produced cutting-edge lubricant technologies for the high performance race industry. These engineered lubricants have extra additives and deliver thermal protection for maximum engine stability under high RPM and operating temperatures. They also provide the best combination formula to minimize frictional loss and protect critical valvetrain components for longer engine life. We know you have invested a lot of time and hard earned money in your project car or daily driver, so protect your investment with the name you can trust – Edelbrock!